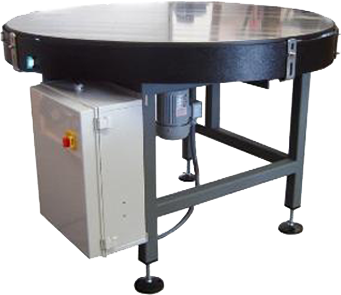 Image above is a PLC controlled indexing industrial turntable. This customer mounted injection molds on the table top and then interfaced this turntable's AC Tech PLC controls with their own robotic injection equipment. Image left is a PLC controlled indexing industrial turntable. This customer mounted injection molds on the table top and then interfaced this turntable's AC Tech PLC controls with their own robotic injection equipment. AC Tech Variable Frequency Drives or Servo Systems from a variety of vendors. Have a favorite? Just let us know. We will make every effort to use common components already used in your facility. This can greatly reduce inventory costs and improve maintenance familiarity. Heavy duty industrial turntable tops cut to size with high precision CNC water-jet machinery. This allows us to precisely position mounting for your part holding fixtures or table mounted objects so you don't have to. Available industrial turntable top materials include steel, aluminum, stainless steel, plastics of many varieties including UHMW, HDPE, Acetal or Lexan. Images above are of a high speed part finishing industrial turntable. This customer clamps a jet engine cowling to the slots in the table top, Then sands and finishes the parts for the aviation industry. The mounting slots were cut by our CNC water-jet machinery. Also not visible in the image are guide grooves machined into the table top surface at 1/2 inch intervals to assist the operator when positioning the parts. Whatever the application our heavy duty indexing industrial turntables can be matched to your needs. Let us help you with your turntable interface. Our engineers are available for consultation for your mold mounting, indexing or part finishing needs. We understand that most applications for indexing or part finishing industrial turntables will be custom builds. We are ready to help you design an economical turntable to interface with your existing machinery or for equipment to be purchased.